Choose From Two Options (Basic or Premium)! Eliminate gas, bloating, acid reflux, etc. 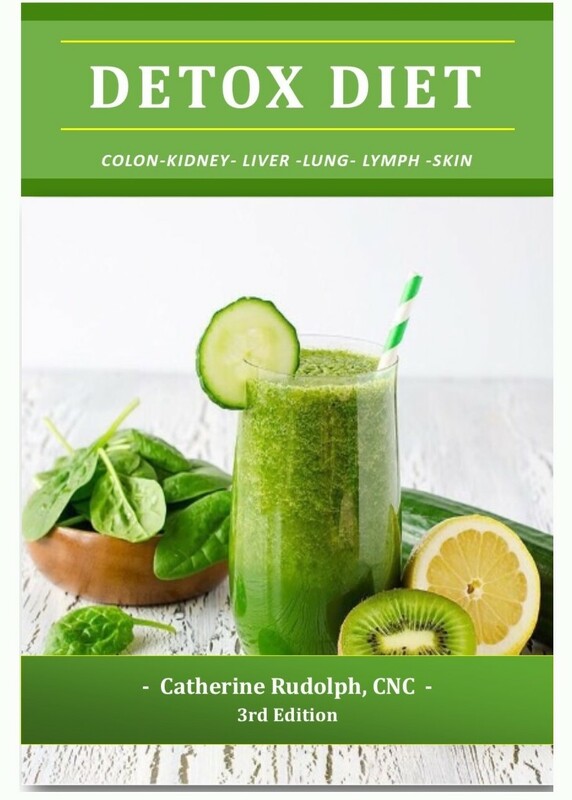 Catherine’s 21 Day Detoxification Program is designed to help you break the addictions of sugar and processed foods, while learning how to make simple healthy recipes, using proper food combining principles, to help you effectively and safely cleanse vital organs and achieve optimal health. 21 Day meal plan with a variety of options per meal. Detoxification tips and techniques to safely rid the body of toxic waste. Detailed instructions on how to safely cleanse the liver with liver/gallbladder flushing, kidneys, lungs, lymph, and skin. Access to a private web portal where you’ll find all of the tools you need for a successful detox (tutorial videos, eBook, additional information). Tutorial Videos (via the private web portal) to fully prepare you and walk you through each step of your detox. Allowing you to learn on your own time schedule at your own pace with the ability to stop, start, pause, and watch the teachings as many times as you like. Support – Lifetime Access to our private Facebook Group where you can interact with others in your detox journey, gain support, accountability, and get questions answered by Catherine and other detox members. If you are not on facebook you can always email your questions to us and we will be happy to help! Nutritional Products/Supplements not included in the basic package, but are recommended for best results. If you do choose to use nutritional supplements, shakes, or powders, etc., use only Catherine’s recommended products to ensure best results. (available in premium package or ala carte at check out). Buy Basic Detox Package Now! Buy Premium Detox Package Now! Phase 1 is focused on eliminating processed foods, and flooding your body with nutrients through quick simple healthy recipes. All recipes include proper food combining to maximize digestion and weight loss. Phase 2 Catherine walks you through colon, kidney, lymph, liver/gallbladder, and juice cleansing, to eliminate the toxic waste from the body safely and effectively without bottles full of pills. Phase 3 will be similar to phase one with additional new recipes. The food in the detox is real food you can purchase at your grocery store. If you’re new to healthy eating, Catherine will walk you through prep week and food items that may be unfamiliar to you. The recipes are primarily plant based including smoothies, fruits, vegetables, beans, potatoes, soups, vegetarian chili, and a few animal food meal options. You will have a good variety of healthy recipes you can enjoy ongoing. This detox is far superior to most detox programs out there that are simply a box of pills or an extreme juice cleanse. You will learn how to make healthy food choices and meals that will set you up for a lifestyle of healthy eating. HI Catherine, Just wanted to tell you this is the FIRST time in my life I have actually stuck to the program 100%! ….. so far. I really like the recipes in the detox book. I look forward to the smoothie in the morning. It’s so good. All is going really well with NO….absolutely NO cheating…….so far haha. OH! I’ve lost 6 pounds! Woohoo! And I have energy now that I got past the headaches, but I’m also irritable a lot which I assume is because I want that bread or the dinners I cook for my family that smell so good hahahaha. I can’t believe my willpower! I must REALLY want this. I can not thank you enough! I am happy to share I completed my first liver flush, and I have to say the whole experience and process was AMAZING!!! I was really nervous and I guess a little fearful of the “unknown” as to what was going to happen and if I could do it (in spite of Catherine’s awesome instructions and guidance, plus the tips and encouragement from the girls in the monthly group). I guess that’s natural for the first time! My encouragement to anyone who is fearful of doing the CE and/or liver flush is to TRUST the process and all the information/materials/videos that Catherine has provided. You won’t be sorry!!! The actual liver flush was WOW, unbelievable!!! I was so excited how well it went!…probably about 20+!!! I feel like I had GREAT success and am excited to do another one this summer!!! I feel SO GOOD!!! I know the food combining has made a big difference. I would occasionally get acid reflux and that is gone. I don’t have that bloaty, icky feeling after a meal. I’m sleeping better at night. My hot flashes have subsided, and I lost 9 pounds!!! A HUGE THANK YOU to Catherine for all you do!!! God has blessed you with the gift of teaching and sharing! Your program is AMAZING and all the teaching materials, videos, support and encouragement are priceless!!! I’m so thankful to be a part of this group and on a journey to health and healing!! !